I recently stumbled upon pictures of Genevieve “Bunny” and Nicholas “Nicky” du Pont’s Palm Beach home, taken in April 1964 and featured in New York Social Diary’s “Resort Life” series. Located at 977 North Ocean Boulevard, “Casuarina” is a bermuda-style, direct oceanfront home, designed by legendary architect John Volk and decorated by Valerian Rybar. At the time, Rybar was known as “the world’s most expensive decorator to the world’s wealthiest,” according to NYSD. A tailored white sofa piped in lime green is paired with green lacquered side chairs upholstered in a zebra-inspired print. Faux bamboo side tables and whimsical sconces complete the look. An octagonal skirted table with green diamond accents, surrounded by X-benches, complements the sofa. Note the crisp white walls throughout the home, which serve as a the perfect background for the bold pops of color. Blue and white Chinese porcelain combined with coral accents… a look that remains wildly popular today! Faux bamboo, lime green and white… a combination just as crisp today as it was 50 years ago. This chintz reminds me of Carlton Varney… does anyone know the name of the pattern? Bunny du Pont shows Stanton Griffis the courtyard pool. Nicky du Pont (center) with Wallis, Duchess of Windsor, and Edward, Duke of Windsor. The above images are from the Ellen Glendinning Frazer Ordway collection. Ellen Frazer began keeping extensive diaries in the late 1920s, recording and photographing the life around her family and friends, and creating a chronological scrapbook of photographs, invitations, and published newspaper and magazine articles. You can read more about the collection here and here. Augustus Mayhew, author of Lost in Wonderland: Reflections on Palm Beach, shares regular installments of the archival collection via New York Social Diary. It is one of my favorite reads! 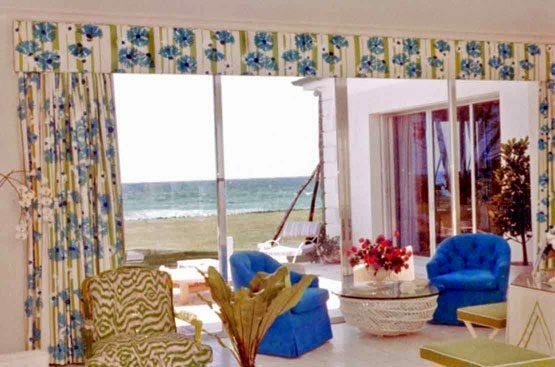 To see more of the du Pont home, please visit the New York Social Diary: Chapter XXV: Resort Life, March-April 1964. Ellen Glendinning Frazer Ordway’s photographs are courtesy of the Lucius Ordway Frazer Collection©, and are reposted with permission via The Classic Preppy. So interesting Andrea! And I totally agree, if it not for the picture quality, I would say this home is in the NOW! I love it! Especially the green bedroom with the twin beds. You always find the chicest homes. I agree with the timeless comment. The first photo is gorgeous, and totally modern and fresh. Amazing. I love this kind of historical post! Love these images….and yes you are right….it is so "right now" with the design style! Uncanny how it's so chic in today's time. My favorite is the dining room, and the white sofa. Once again style transcends time….beautiful. I am dying over the green lacquer desk on the right in the second picture. It is just amazing how Palm Beach Chic is so timeless. "everything old is new again!" thanks for posting these great pics. Such amazing spaces. I wouldn't change a thing after all these years. "Happy" and color are timeless. So pretty and quintessentially Palm Beach, beautiful! Have a great weekend.